A television interview of a top Qatari official confessing the truth behind the origins of the war in Syria is going viral across Arabic social media during the same week a leaked top-secret NSA document was published which confirms that the armed opposition in Syria was under the direct command of foreign governments from the early years of the conflict. A 2013 London press conference: Qatari Prime Minister Sheikh Hamad bin Jassim bin Jabr Al Thani with U.S. Secretary of State John Kerry. 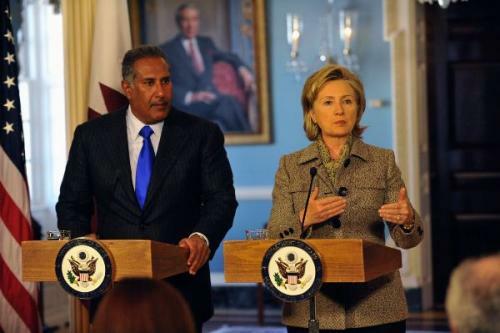 A 2014 Hillary Clinton email confirmed Qatar as a state-sponsor of ISIS during that same time period. Below is the key section of Wednesday’s interview, translated and subtitled by @Walid970721. Zero Hedge has reviewed and confirmed the translation, however, as the original rush translator has acknowledged, al-Thani doesn’t say “lady” but “prey” [“al-sayda”]- as in both Assad and Syrians were being hunted by the outside countries. 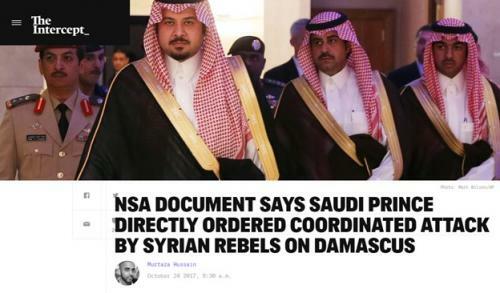 The newly released NSA document confirms that a 2013 insurgent attack with advanced surface-to-surface rockets upon civilian areas of Damascus, including Damascus International Airport, was directly supplied and commanded by Saudi Arabia with full prior awareness of US intelligence. As the former Qatari prime minister now also confirms, both the Saudis and US government staffed “operations rooms” overseeing such heinous attacks during the time period of the 2013 Damascus airport attack.